Thai Immigrants' Microbiomes Get Less Diverse Upon Move To U.S. The bacteria, viruses, and other microbes in our digestive tracts, collectively known as the gut microbiome, are increasingly the culprits of our body’s health. These mix of microbes may affect our immune systems, digestion, metabolism, and even how bodies respond to cancer treatments. And we know that at least some of these microbes are inherited. But what role do our lifestyles play in our gut microbes? And what happens when we move to a new country? Writing last week in Cell, researchers describe the differences between ethnic Hmong and Karen people living in Thailand, to members of same groups after recent emigration to the United States. 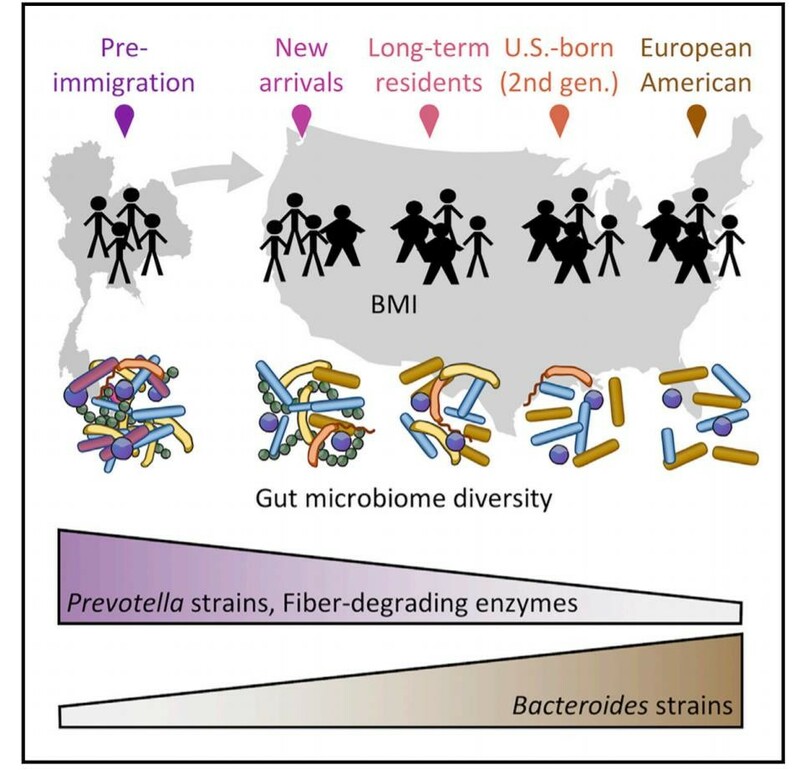 Not only were the new U.S. residents likely to have different microbes than those living in Thailand, but the diversity of their gut microbiota was much lower. This change persisted and even worsened in the second generation. Study co-author Dan Knights, a professor of computational microbiology at the University of Minnesota, explains the findings. Plus, NYU Medical School professor Martin Blaser weighs in on our growing understanding of how our gut microbes interact with our health, and the declining diversity of gut microbes in developed nations. Read the original paper from Cell. Martin Blaser is the author of Missing Microbes: How the Overuse of Antibiotics is Fueling Our Modern Plagues (Henry Holt, 2014) and director of the Human Microbiome Program at the New York University School of Medicine in New York, New York. Dan Knights is a professor of Computational Microbiology at the University of Minnesota in Minneapolis, Minnesota. Pajau Vangay is a former research assistant in the Knights Lab, in the Department of Biomedical Informatics and Computational Biology at the University of Minnesota in Minneapolis, Minnesota. FLORA LICHTMAN: This is Science Friday. I’m Flora Lichtman. Each of– each one of us houses billions of tiny residents– viruses, bacteria, fungi. And we know our microbes can influence our health, but what influences their health? They’re affected by what you eat, what medicines you take. But how about where you live? That’s one of the questions we’re looking at next. How does where you live affect what lives in you? And what does that mean for your health? A new study may provide some clues. Researchers found that Hmong women who moved from Thailand to the US saw big changes to their microbiome within nine months of getting off the airplane. Here to tell us more are my guests– Dan Knights, professor of computational biology at the University of Minnesota in Minneapolis. He’s co-author on this new research. Welcome to the show, Dr. Knights. DAN KNIGHTS: Thank you. Good to be here. FLORA LICHTMAN: And Martin Blaser, professor of medicine and microbiology at NYU School of Medicine here in New York. He’s in our studios here in New York. And just a note, he was not involved in this research. Welcome back to Science Friday, Dr. Blaser. FLORA LICHTMAN: So Dan, let’s start with this study. What happened to people’s microbiomes when they moved to the US? DAN KNIGHTS: What we found is that moving to a new country, at least for the people in our study, meant that you pick up a new microbiome. People almost immediately began losing some of their native microbes and began picking up the new US-associated microbes. And we found that that was not enough– the microbes that they picked up were not enough to compensate for the ones that they lost. So they had an overall loss of diversity over time spent living in the US. FLORA LICHTMAN: And this happened fast. DAN KNIGHTS: That’s right. We saw an immediate– almost immediate changes. Within the first six to nine months of living in the US, people had up to a tenfold increase in the amount of US microbes relative to their native microbes. FLORA LICHTMAN: And is there health implications of this work? DAN KNIGHTS: Well, we know from many previous studies that having the wrong set of microbes can cause a wide range of diseases– diabetes and obesity, inflammatory diseases, allergies– and can increase your risk of infection. In our study, we didn’t actually show that these changes were causing obesity in this population, but we did see that the changes were associated strongly with obesity. FLORA LICHTMAN: We’ve got a correlation not causation situation. FLORA LICHTMAN: So the lead author on this work was Dr. Pajau Vangay, who couldn’t make it on the air with us today. But she wanted to emphasize that the microbiome changes couldn’t be blamed solely on those Americanized diets. PAJAU VANGAY: And I think that almost everyone that I talked to about this study thinks that it’s just diet, that it’s the diets that are changing and that’s why everybody’s gaining weight or developing diseases and whatnot. But we didn’t actually see that. We saw that the microbiome changed a lot faster. And it makes sense that these diets aren’t changing that much because there’s been a lot of nutritional studies that have looked at dietary changes in Hmong, for example, and they see that even first and second generation Hmong, they’re not eating completely American diets. FLORA LICHTMAN: Martin Blaser, does this then open a mystery of why this is happening? If it’s not just diets, why? MARTIN BLASER: Well first, I think it was a really beautiful study. They really took advantage of a great situation and made great science out of it. But these were not two ordinary countries. This was Southeast Asia. These were countries where people live traditional lifestyles. And then they moved to the United States, which is an industrialized country where many things are different in addition to diet. So I don’t think it would be the same, let’s say, moving from France to the US or vise versa. It’s speeding up industrialization, a 100-year process, by one jet plane flight. FLORA LICHTMAN: Yeah. I wanted to ask you, what do we already know about how people’s gut microbiomes differ around the world? MARTIN BLASER: Well, what we know is that people who are from very traditional cultures, hunter-gatherers, people living in villages far, far away from the modern accoutrements of life, their microbiome has very high diversity. And people in industrialized countries, it’s much lower. So this study encapsulates that. And the people in the traditional societies, they’re living on different continents. They’re different ethnicities. They have different diets. And it’s the same with the people in the industrialized countries who’ve been studied. So it’s not diet, ethnicity. I think it’s modernization. FLORA LICHTMAN: Modernization, but what specifically? Dan, do you have any theories? DAN KNIGHTS: One of the major culprits, apart from diet, is antibiotics. And it’s been shown in many studies that antibiotics can deplete the diversity in your microbiome, and even that you can pass on some of those missing– the depletions in the microbiome to your children. That’s been shown in animal models. So that’s one obvious culprit. I think there are still some factors in the diet. People in the US tend to have very low fiber content in their diets. And some of the microbes are very picky about which types of fiber they like to eat. So we do think that loss of fiber is another factor that’s causing some of the microbes to disappear. FLORA LICHTMAN: Was there a trend, Dan, in terms of what people lost? What kinds of microbes? DAN KNIGHTS: Yes. People living in the USA tend to be dominated by this one group of microbes called Bacteroides. It’s kind of a US marker of living in the USA. And we saw that people in our study tended to lose their dominant microbes, which are from this other group called Prevotella, and then began picking up more and more Bacteroides. And as we saw this happen, it seemed that they were losing– when they lost these Prevotella microbes, they were losing the ability to digest certain types of plants. FLORA LICHTMAN: Martin, do you think that this is the key, which microbes are being lost? MARTIN BLASER: I think two things are happening. One is this loss of diversity, which Dan mentioned. And the other is this substitution. These Prevotella and Bacteroides, they’re kind of cousins. And the country cousin has been replaced by the city cousin, in a way. And this work confirms previous work of other investigators showing the same thing. It seems to be happening all over the world when you look at more– people from more industrialized countries. And these immigrants, they’ve entered the industrialized country, and this displacement has occurred. FLORA LICHTMAN: So we see the displacement occurring really fast over the course of months, but what happens over the longer term? Dan, did you look at first generation and second generation immigrants? DAN KNIGHTS: Yes. The changes start almost right away when people get to the US, but then they continued over time. We had people in the study who had been in the US for decades, and they continued to lose diversity and pick up more and more of the US microbes over time. Another surprising part of the study was that we saw this very sharp drop in diversity in the children of immigrants. So these are second generation immigrants who were born in the US but whose parents had immigrated from Thailand. And they tended to have significantly lower diversity than their parents. We thought this might happen because we’ve seen similar things in animal studies, but it was pretty striking the way that it happened within a single generation in humans. FLORA LICHTMAN: Martin, does this hold across the world, the makeup difference that we see in this study, the Prevotella versus the Prevotella? MARTIN BLASER: Yes, but I want to comment on the generational thing because I think that’s really important. About 10 years ago, Dr. Stan Falcow and I proposed that the microbiome was being lost generation by generation, that instead of the microbiome resetting with each new generation, that each generation in this loss process was passing on– moms were passing on a reduced microbiome to the next generation. And there are studies in animals that are supporting this. Now we have this beautiful study of the immigrants providing further support for the idea that this intergenerational transfer of microbes which has been going on since forever for all mammals seems to be things– each generation is getting worse. FLORA LICHTMAN: Does that mean you inherit your microbes from your mom or your parents? MARTIN BLASER: You inherit a lot of your microbes from your mom. And there’s lots of support for that idea. Mom is important. FLORA LICHTMAN: Is there any way to intervene? Can we repopulate our microbes? MARTIN BLASER: Well, many people are interested in this idea, starting from babies born by Cesarean section trying to do vaginal seeding, which people have called bacterial baptism, to give back bacteria. And the idea potentially of restoration is very important, because with losses of this magnitude, we can’t get them back with just one or two strains. It’s going to have to be much, much more significant. FLORA LICHTMAN: And are there any other interventions that seem to work? MARTIN BLASER: Well, Dan’s point about fiber is very important. That’s one of the big differences between those traditional diets and ours. And a lack of fiber seems to be selecting for some of these particular changes. FLORA LICHTMAN: What are some of the health implications? And we talked about obesity for this study, but there are broader health implications, right, of losing your microbes? MARTIN BLASER: Yeah. Well, you know that I’ve written a book about this called Missing Microbes. And my point is that we have all these diseases that have arisen essentially since World War II– asthma, obesity, diabetes, juvenile diabetes, inflammatory bowel disease. They’ve all been going up. And maybe they have 10 different causes, or maybe there’s one thing that’s underlying it all. And my hypothesis was it’s the loss of microbes, this loss of diversity and this substitution that’s being shown. So one of the reasons I like this study so much is that it provides a lot of evidence that supports that this is actually happening. FLORA LICHTMAN: Martin, is this a radical idea, yours? MARTIN BLASER: You know, that’s hard for me to judge. Why don’t you ask Dan? FLORA LICHTMAN: What do you think, Dan? DAN KNIGHTS: I think there’s increasing evidence. As I said, it’s been seen in animal models very clearly, and now we’re starting to see it happen in people. So I think anyone who found it radical previously I think is probably more inclined to accept it. FLORA LICHTMAN: Dan, can these findings be used to help immigrant communities? DAN KNIGHTS: Well, some of the things that we took away from this are really about the importance of the traditional lifestyle. This study was run in a close collaboration with the Hmong and Karen communities here in the Twin Cities. They helped design the study and helped design the interpretation and dissemination of it. And one of the things that was important to them was that preserving their traditional lifestyle, their traditional diets, may have health consequences beyond just preserving their cultural heritage. FLORA LICHTMAN: So I want to talk a little bit about how you do studies like this in the right way. The Hmong and Karen groups are coming to the United States as refugees, and we know that the history of science is riddled with bad stories of exploitation of groups. So we asked Dr. Vangay, the lead study author, about this point. PAJAU VANGAY: Definitely the stool samples. Anytime you’re giving some part of yourself away, I think there’s a little bit of questioning what you’re going to do with the sample. And then, second, I think a lot of people may not be familiar with research. It’s a new concept for these community members. That said, on the flip side of that, some people are familiar with it, and they may have had negative experiences. And so that makes it a little bit difficult too. FLORA LICHTMAN: I’m Flora Lichtman, and this is Science Friday from WNYC Studios. So Dan, let’s start with you. How do you do this– how do you do these studies in the right way with these considerations in mind? DAN KNIGHTS: Well, this was really a great experience for me as a researcher because we used a process called Community Based Participatory Action Research, or CBPAR. We had a close collaborator Kathy Culhane-Pera, who’s in the community and is a doctor who’s worked with these populations for a long time. And she helped us set up a community advisory board, who was an integral part of the entire planning– process of the study and of carrying it out. And we also hired community-based researchers. So there are co-authors on the study who are Hmong and Karen members of the community. We hired them and trained them to enroll and consent subjects and collect samples. And so they actually got to be a part of doing the science. And I think that connection has helped us keep the science relevant for the people involved and help them find meaning in it and actually be glad that they participated and not feeling that they were taken advantage of. FLORA LICHTMAN: Martin, I know you’ve worked all over the world too, cataloging the microbial populations of people from all over. Have you had– have you had to convince people to work with you? Has that been challenging? MARTIN BLASER: Well, I’m the person who carries the bags. Actually, my wife, Maria Gloria Dominguez, has led a lot of these studies. And she tells the story that people are often reluctant to give their blood, but then they say, well, you’ve come all this way to get our poop? And they’re very amused because it doesn’t seem to have so much value to them. FLORA LICHTMAN: Martin, I’m worried about my microbes going extinct. Not mine, the whole world’s microbes going extinct. Is this a problem I should be concerned about? MARTIN BLASER: Yeah, you do. You need to be concerned, and you need to be concerned for your children and your grandchildren, because this seems to be happening. So a few weeks ago, a group of US led by Maria Gloria wrote a paper in Science proposing that we establish a vault, a microbiome vault to protect these organisms from going extinct so we can save them for future generations. FLORA LICHTMAN: It’s almost like a big game reserve, but a little game reserve. MARTIN BLASER: Yeah. You know, there’s a seed vault up in Svalbard in Norway. And this is based on that same idea. Preserve the diversity while we have it, because once it goes extinct, it’s gone. FLORA LICHTMAN: Do you think that that could happen? MARTIN BLASER: We hope so. We’ve started a nonprofit foundation to move this forward, because the time is now. These populations– antibiotics are everywhere, and change is everywhere. I think all the populations of microbes are under threat, some more than others. And we have to preserve the ones in those developing countries. FLORA LICHTMAN: Dan, any last thoughts in the few seconds we have left? DAN KNIGHTS: Well Marty, we’ll be sending you some microbes to preserve. FLORA LICHTMAN: I hope it happens. I want to thank you both for taking the time to be with us today. Dan Knights, professor of computational biology at the University of Minnesota in Minneapolis, and Martin Blaser, professor of medicine and microbiology at the NYU School of Medicine here in New York, thank you both. DAN KNIGHTS: Thank you. That was a pleasure. FLORA LICHTMAN: Thanks to Pajau Vangay, lead author on the immigration study. She couldn’t be with us, but you heard her thanks to the magic of digital recording.